How is Social Media reflecting the best and worst of us? I believe it's worthy to name a few shameless situations I've experienced while working within the Social Media industry to be realistic and responsible about how can we improve the content creation process and consequently refine what we see on Social Media. Creative control responsibility rules the process. I've sent someone a tip via Insta stories and got a pretty harsh reply. In this specific situation, someone wasn't open to accept my advice which was a response to the following question, how many pictures should I post per day, 3 or 4? I've said one is more than enough, and the person goes: accordingly to who? Followed by an ironic emoji, full stop. That makes me think about how Social Media brings up the best and the worse of us. In this specific case, the person was intimidated by the fact I was against her opinion by replying defensively. I was watching the news the other day while the reporter is scrolling over a big screen and commenting a battle of tweets between Elon Musk, who called Vern Unsworth, one of the rescuers who helped save the young Thai football team trapped in caves, a "pedo". Hold on a minute, so now we are going to use the news to merchandise? 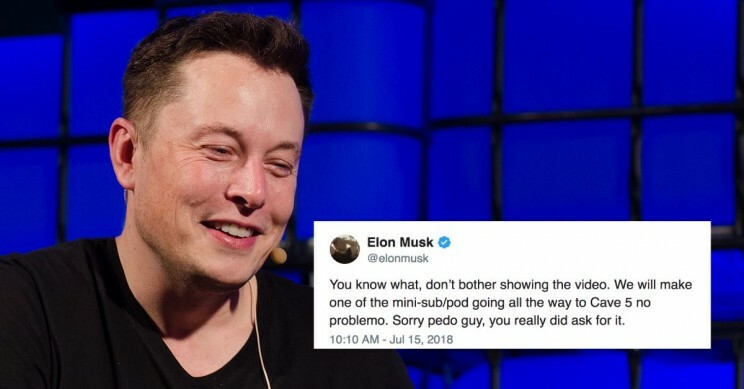 The "pedo" helped to save the kids while Musk continues trapped in his "futuristic cave". I took part in an influencer's event, and I was amazed by the fact more than ten people were literally over the table to photograph food. They have lights, hair and hands touching the food plates and cutlery. You can sense the tension growing on the room for the sake of taking the "best pic" to get more attention on Social Media, afterwards everyone seats and eats, disgustingly. I became much more selective when it comes to food events since back then. I was invited by an Influencer to go and try a new ice cream shop. We never saw each other before so this was a blind date equivalent. We walk to the shop over small talk. The girl orders ice cream, while the guy behind the counter is preparing it, she runs to the toilet to change her outfit. She didn't ask anything about the business or what is unique about it, on her way back she grabs her ice cream and leaves the shop in search of "the best lighting". The question is by which means are we getting attention? All situations above have something in common, a careless urgency of attention without reflecting on the consequences or those involved in it. Companies need to acknowledge that when putting an Influencer Marketing Strategy together before investing a considerable amount of budget on a face that is going to do nothing but perform. It all narrows down to driving attention to content and find how can that particularly influence someone to engage or make decisions. I believe creating content for Social Media is a powerful tool to build up and deconstruct realities, what is quite typical to the mass media discourse too, however, aren't we talking about decentralisation of content? Individuals, who have the autonomy to express themselves genuinely to create and choose, filter what they want to see? Therefore, storytelling is the antidote for lack of transparency on the content creation process. Changing attitude and approach is an excellent step because when you're merely narrating facts, you're less likely to find copies out there. Well, technically speaking that's the central pillar of journalism in a sense. Companies such as Dove and Vice are early adopters of this approach, and they're one of the best examples to look into these days. They smartly prove that content creation it's not solely about creating and sharing ideal situations, and beautiful moments, it's not only about beautiful faces, but adding more into it, history, information, interaction, imperfection, ideas, causes. I believe a terrible thing about Social Media nowadays is that we are continually mirroring ourselves to perfection instead of acknowledging that this is purely a vision. A distorted perception of reality because we can't live in a world where everyone is smiling and having ice cream all the time, especially when there's a lot more going on under our noses. As much as content creators need to have independent and creative control over their content to remain true to themselves, by all means, there is no way companies should encourage a distorted vision of reality.